Yesterday I was in St Sampson’s Square celebrating local food, producers, independent restaurants and retailers in York for the 21st edition of the York Food & Drink Festival. Yorkshire has become renowned for its endless number of fantastic food producers and restaurants and has become a gastronomic haven for even the most discerning food critic. This is partly why my family and I settled here in God’s Own County nearly five years ago. It is so fantastic that events like the York Food & Drink Festival take place each year to celebrate Yorkshire’s foodie heritage and it is always an honour for me to play a part. I demonstrated my recipe for profiteroles in front of large crowds, all of whom had gathered in York to commemorate the Festival and everything that York can offer. Other than the educational demonstrations, features of the Festival included the Young Chefs Competition, Ale Trail, Taste Trail and an evening programme which attracts people to stay in Parliament Street after 5pm. Entertainment involved live music, theatre and performances and fashion shows. St Sampson’s Square was packed with people all hoping to learn some top tips and handy hints to make cooking easier and more fun. As I took the crowd step by step through my recipe I demonstrated my favourite methods for stress-free cooking. Place the butter, salt and water in a saucepan. Place on the heat. Bring to a boil. Remove from heat and pour in all the flour in one go. Stir with a wooden spatula, making sure there are no lumps. Return the mixture to the heat, stirring with a wooden spatula, until the pastry comes away from the sides of the saucepan and forms a ball. Transfer into a cold bowl and set aside to cool for 5 minutes. You can also return the dough to the stand mixer and beat it a little with the flat beater to make it cool down. One by one, add the eggs and combine with a wooden spatula. The choux pastry is now ready to use, and should be used immediately. Preheat the oven to 170°C. Pipe the choux buns on a greased baking sheet (using butter or oil spray) and bake until golden and hollow. Melt the chocolate with butter, mix and add hot water. Cut off the top of the choux buns and put them aside. 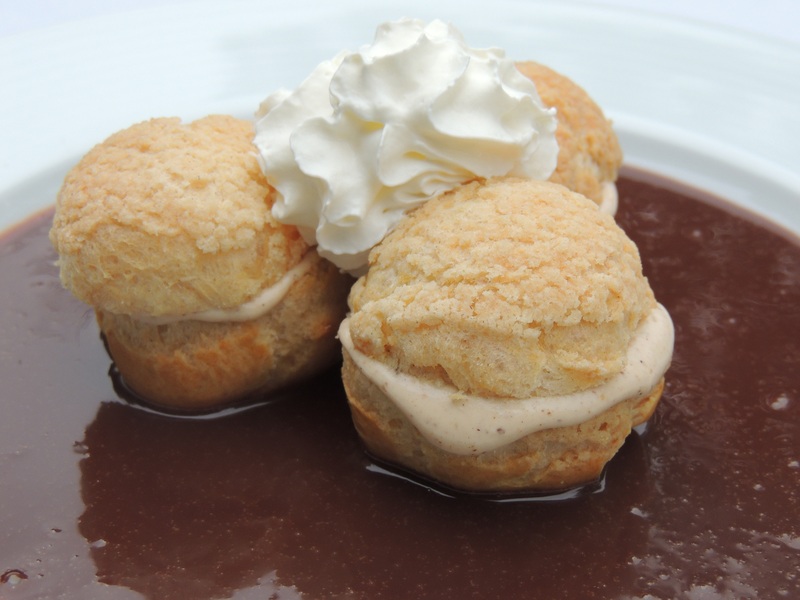 Fill the buns with the praline Chantilly and put the tops back. Since falling in love with God’s own county and moving here from Paris I have loved learning about all the delicious food that Yorkshire and Britain has to offer. 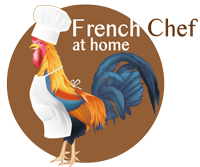 When creating recipes, I always try to take inspiration from traditional British ingredients and dishes – before adding a special French twist. Buying lots of my ingredients locally has made me really appreciate the huge variety of fresh produce grown around Yorkshire. I really hope that by creating recipes like the one below in conjunction with celebrations like British Food Fortnight, I will encourage you to buy more British produce and when you go shopping be much more aware of where your food comes from. Boil the watercress in salted water for 5mns, drain, and leave to cool down and press using a tea towel. Heat up the cream and add to the watercress. Blend and add the eggs. Add salt and pepper. Fill the ramekins ¾ of the way up and cook it in a water bath at 150 degrees for 45mns. Unmould when lukewarm. Chop the tomatoes, onion and garlic and cook with the lid on for 20mns in a frying pan with the olive oil, add the tomato concentrate. Add salt and pepper. Dry roast the scallops in an non-stick frying pan, 1mns on each side. Add salt and pepper. 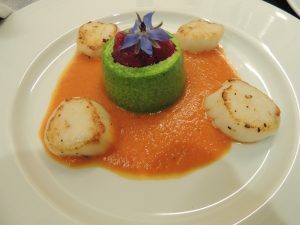 On each plate, pour the tomato coulis in the centre, place the flan on top of it with the scallops around it. Put the beetroots in the juicer and use the foam from the juice to put it on top of the flan. Autumn is well and truly here and what better way to celebrate than dishing up a delicious seasonal recipe at the Harrogate Autumn Flower Show. The Show was bustling with throngs of people eager to take in the sights from the giant vegetable competition and autumn garden borders, to the plant nursery pavilion and the Feast! Food Theatre. 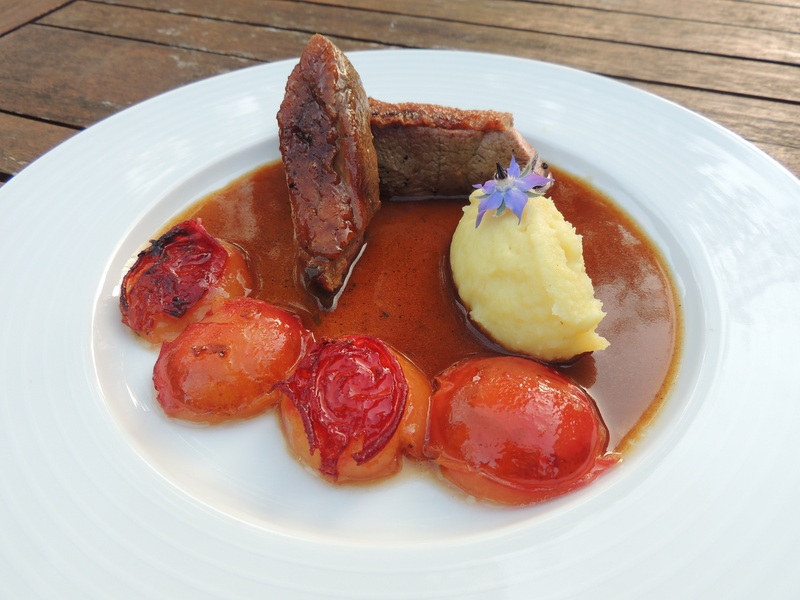 Alongside many talented chefs, I demonstrated my Roasted duck breast with Victoria plum and verbena sauce to a crowd of people celebrating the beginning of the harvest season. The Feast! Food Theatre was packed with an enthusiastic crowd keen to learn some of the tricks of the fine dining trade and enjoyed the delicious aromas generated by my rich duck and seasonal plums. In a frying pan, dry roast the duck on the side with the skin until golden brown. The fat needs to reduce to half the original amount. Flip the breasts over and leave to cook for 2 minutes. Put aside in an oven-proof dish. Make a caramel with the sugar and the honey, deglaze with the vinegar, then add the chicken stock and verbena and leave it to reduce by half. Pit the prunes and roast them in a frying pan with the butter until they are stewed. Cook the duck in the oven for 10 minutes in order to obtain a ‘pink’ (rare, medium rare) meat. Slice the duck, lay onto a plate and add the sauce and prunes.